McNary senior Kayla Evans was at work when she got a life-changing email from an university she’d never heard of located 10 miles west of St. Louis, Mo. Before the email, Evans had spoken to a junior college in Washington and another school in Florida but had nearly given up on her dream of playing at the next level. Evans visited Webster’s campus on December 1. She had never been that far away from home and hadn’t been on an airplane since she was too young to remember. “I was so scared because I’m scared of heights,” Evans said. But the campus visit, where she was able to have lunch with current players, eased her fears of going to a school more than 2,000 miles from home. 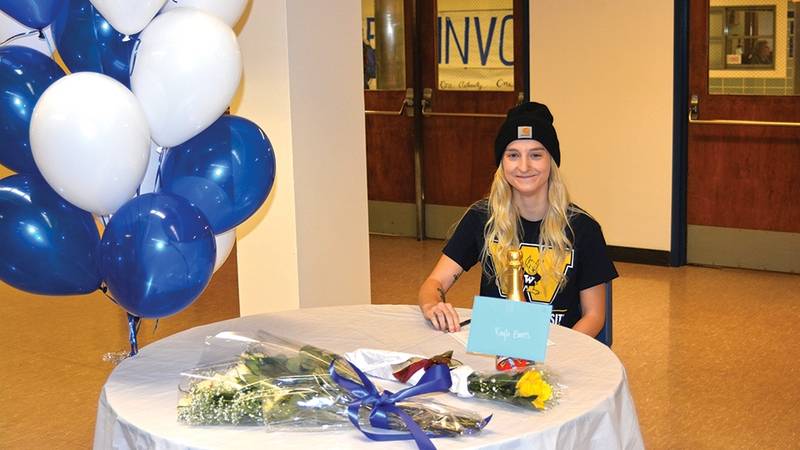 And on Wednesday, Feb. 1, Evans made it official, signing a letter of intent with Webster. “It doesn’t even feel real right now,” said Evans, who has played soccer since she was six years old. Evans thanked her mom and grandma, who haven’t missed a game in 13 years. “My mom and grandma have been my rock through this entire journey,” she said. It was their film of Evans play that was uploaded to the recruiting Website ncsasports.org that ultimately got the attention of Webster. While on campus, Evans was also able to meet a professor in photography, the subject in which she plans to major. With five goals and two assists, Evans, who plans to play forward in college, led the Lady Celts in scoring last season as McNary made the playoffs for the first time since 2009. Evans is also a trailblazer for the girls soccer program, which in the past four years had two girls play at Chemeketa Community College but none to four-year programs. “It’s a big deal. I think it’s the beginning of many more to come,” Lady Celts head coach A.J. Nash said. “To actively be recruited from outside the state and to get that letter and to commit to a program for four years, it’s a fun experience. I had the privilege of going through that as a player and it’s an honor and it’s earned. Even though she’ll be far away, Evans plans to come back to McNary and watch the Lady Celts.